The Hong Kong-style cafe - a world of food all in one place. Albeit with some interesting interpretations. Generally, most work out fine while some miss the mark completely. Where else can you find breakfast that feature a hot dog wiener in place of sausages? How about borscht that resembles vegetable soup or spaghetti bolognese that is so far removed from being a ragu, it could be mistaken for Hamburger Helper. But wait. It may all seem a bit scary; yet it is a type of cuisine that many love despite its extremely unauthentic multicultural menu. Count me as one of them. Yes, I know it flies in the face of good eats if compared to the rea l thing; however, I grew up on this stuff. It has a place in my heart past and present. A more practical reason would be that my son eats this type of food too. That in itself is a reason to like it. 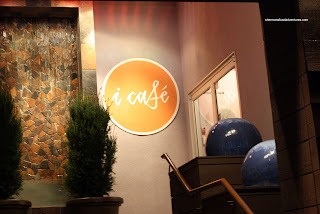 All along, my mom has been bugging me to try i-Cafe. She is a HK-style cafe connoisseur (is there such a thing?) and raves about it. Somehow I never made it out to the old location (now the new London Drugs complex) on Broadway and Cambie. The reasoning for my visit today was due to my aunt and uncle wanting to eat Chinese food. Yes, I know it's not Chinese food as we know (particularly at a HK-style cafe); but it was close enough. You see, they are from San Francisco and since Vancouver has reportedly the best Chinese food in North America, they wanted to take advantage of it. We'd already done a meal at Victoria Chinese Restaurant, Nancy Wonton House and AYCE at Tomokazu. You'd think they might want something non-Asian. Nope, no-can-do. Even his own daughters lament it's all about the Asian food with him. LOL! 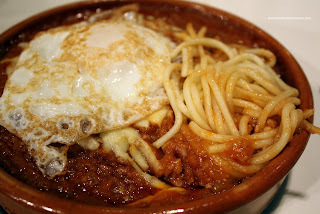 Whenever I'm at HK-style cafe, I go straight towar ds the set meals - the one with lots of meat in particular. I went for the Mixed Grill which consisted of an egg, spaghetti, pork chop, chicken steak and beef steak with a borscht to start. As you can see, the dish is not devoid of meat. 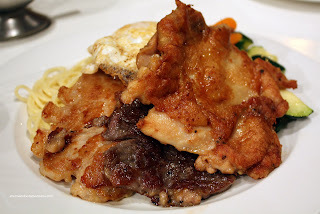 The chicken steak (de-boned leg) was fried up crispy while still being tender and juicy. The pork chop was a bit thin and thus dry. As always at a HK-style cafe, the beef steak had been marinaded with some baking soda; thus it did not resemble a "steak" texture. But I'm used to it and it was tender due to the marinading. 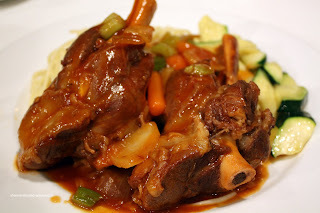 My mom loves lamb (that's probably why I like it too) and she ordered the Lamb Shank meal. Surprisingly, it came with 2 large lamb shanks on a bed of spaghetti and veggies. 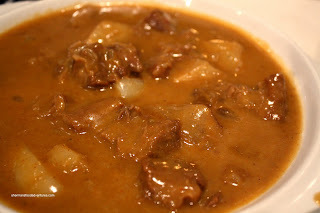 The lamb was decently tender; but not in a gelatinous manner normally found at say, a French restaurant. The sauce was a bit weak giving way to the gamy taste of the lamb. Again, it is what it is and it was decent. Viv went for the Spaghetti Bolognese and it was pretty much horrible. The spaghetti was mush and the sauce was oilier than a used oxy pad. In addition, the sauce was flavourless except for some tartness. 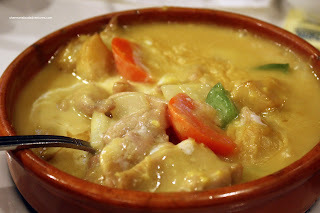 My dad got the Portuguese Chicken, which is essentially a light coconut curry with chicken. The sauce was a tad thin and not really all that strong. Definite hints of curry in the predominantly coconut based sauce. The chicken was quite tender; but didn't show any absorption of flavours. My uncle had the Malaysian Curry. I'm not sure what made it Malaysian to tell you the truth. But it was indeed more spicy than the regular yellow curry you'd normally find at a HK-style cafe. I though the brisket and potatoes were both tender yet still retaining their shape. My aunt had the Baked Seafood Rice. I never got a chance to try it; but there appeared to be quite a good amount of seafood. 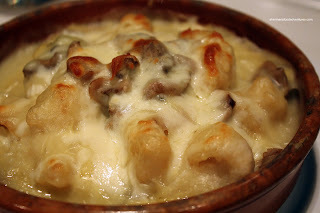 In fact, all of the dishes were well portioned; but for me at least, something seemed lacking. I guess the flavours were a bit off, even for a HK-style cafe. Especially for the prices they charge, everything should have been spot-on. Nothing was completely horrible (except for the spaghetti), yet, I would much prefer Alleluia or Angel Cafe, with Alleluia being much cheaper. We may not be excited about the foodies there but we love their company. Curry King HK style Cafe @Kingsway have increased their prices 20% and the quantity is noticeably less. Inflation eh! But still more reasonable than Hotluck just a couple doors away. They did? I like Curry King... I guess I should stay away from Hotluck? -serving (deleted) meat portion and charge C$. I've a health concern the way they and Alvin Garden dunk in the chilies, seeds and all. Seeds can end up in the appendix causing appendicitis; or burn the digestive tract. According to wikipedia, "a high consumption of chili may be associated with stomach cancer." The only place I've seen where chili seeds are not removed are poor rural areas in Asia where proteins are scarce. No, not gonna stone anyone. Important information indeed! I don't mind the baked stuff from I-Cafe, but the service (everytime I go there) is terrible. I always feel like I'm invisible, and if they do come by, as my friend says:"service without a smile!" Chinese restaurants and service, goes together like oil and water.